Margaret K. McElderry Books, 9780689871535, 32pp. and a bite of the sky. A world of birds unfolds in twenty-two vivid poems that capture the unique personalities of birds from backyard blue jays to toucans and cockatoos. Come sweep through the sky with an eagle, compare table manners with a vulture, and mock a mockingbird -- if you dare! Debora Ruddell's poems are funny and thoughtful, silly and sweet. Joan Rankin's delightful pictures enchant the eye and tickle the funny bone. There is something for everyone who flies through the pages of this brilliantly birdbrained book. 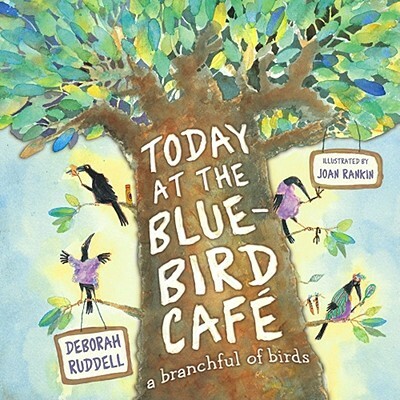 Deborah Ruddell is the author of the celebrated picture books Who Said Coo?, illustrated by Robin Luebs, and A Whiff of Pine, A Hint of Skunk and Today at the Bluebird Cafe, both illustrated by Joan Rankin. Before writing children’s books, she was an art teacher and a graphic designer. Deborah lives in Peoria, Illinois. Visit her at DeborahRuddell.com.